The Museum of World Treasures is located in the Old Town section of Wichita. The first portion of our visit had us staying just across the street at Hotel at Old Town. Housed in a three-story converted paper warehouse, their collection spans a wide range of topics and time periods. 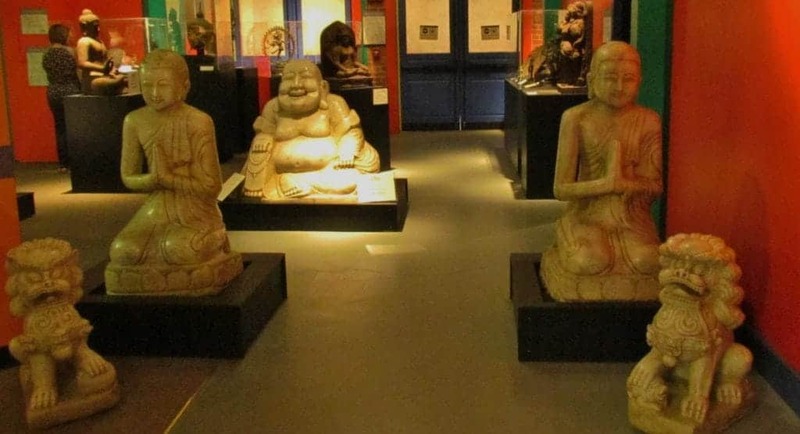 We want to thank the Museum of World Treasures for their hospitality. Rest assured that all opinions are our own. 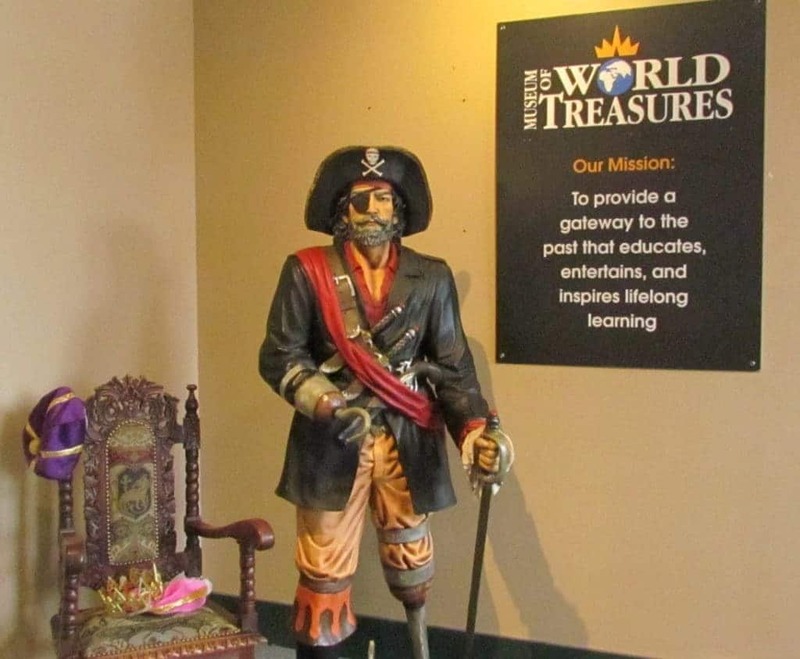 When we arrived at World Treasures, we had a short wait until the staff member could meet us in the gift shop. This gave us a few moments to explore some of the replica artifacts that can be purchased. It only lasted a moment, before our host arrived. We had the honor of receiving a tour from Lon Smith, the Chief Development Officer. He explained to us that the name was carefully chosen, as this is not a standard history museum. 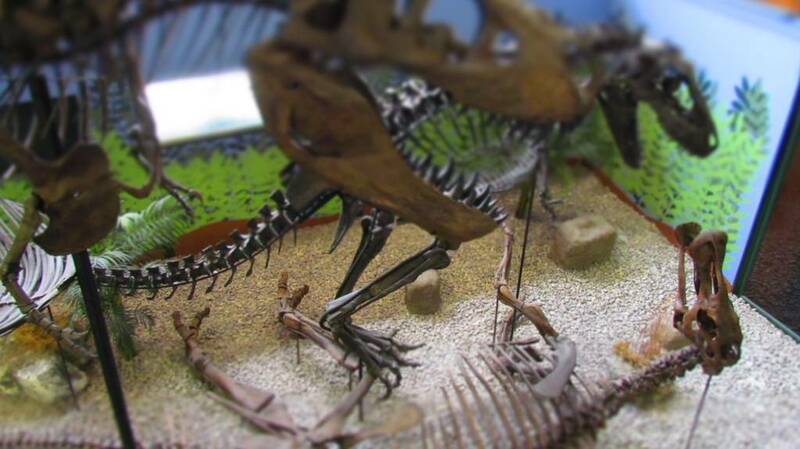 The collections are from a local doctor, and his wife’s hobby of purchasing artifacts. Over time it has grown, and eventually needed a larger home. That is how it ended up in its current location. He started at the beginning (I know, that should be obvious.) of the geological timeline for the World Treasures Museum. The first exhibit is also the most popular. Ivan the T-Rex has a prominent spot in the museum, as there are few examples as complete as this one. 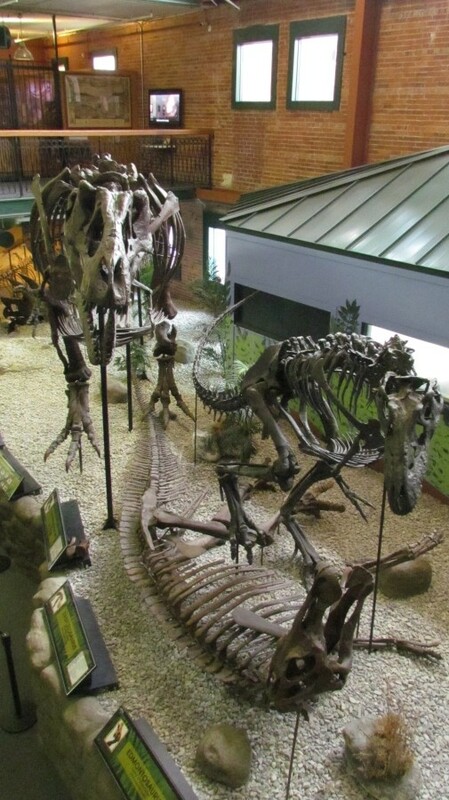 The fossil gallery contains an assortment of dinosaur skeletons, both land and sea dwellers. 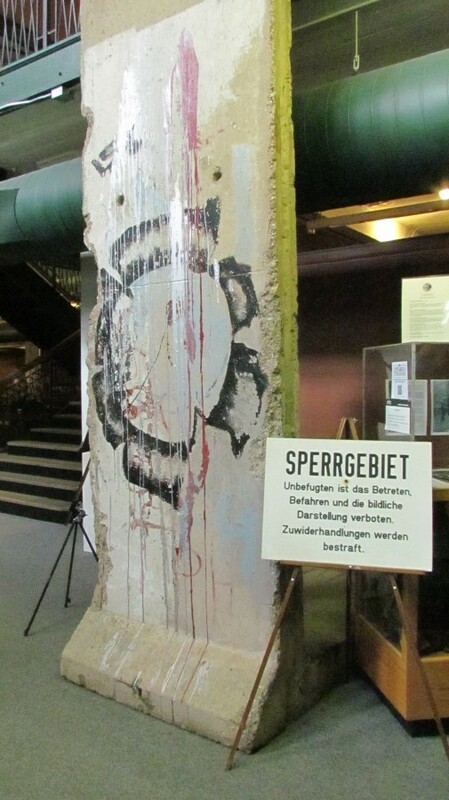 As we walked through this section, we passed a piece of the Berlin Wall. 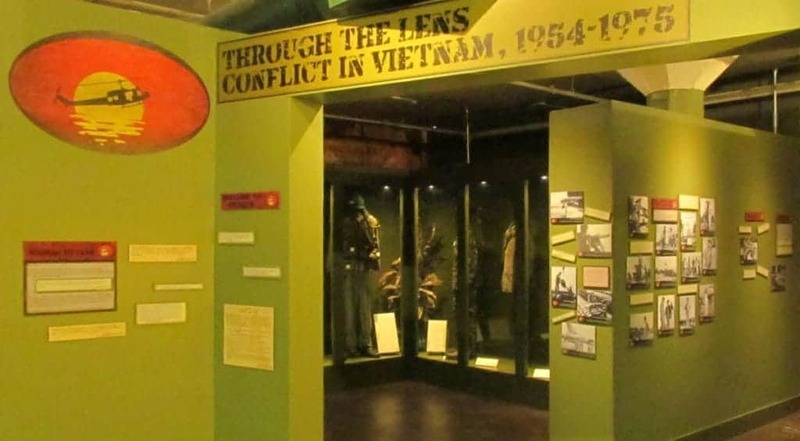 Lon pointed out that it would be better suited on the second floor, which holds the World War II exhibit. Since it weighs around 9000 lbs., it seemed logical to keep it on the first floor. We agreed with him on this. We passed through the fossil zone, and entered into an area filled with world treasures from various foreign cultures. The doctor and his wife spent a good deal of time traveling. They also visited quite a few auctions, where they procured some of their world treasures. Lon described their purchasing pattern, as we walked through the Asian, African, Ancient Greece, and Roman displays. It was astounding the number and variety of pieces that they had amassed. The next section was all about the Pre-Hispanic period in Central and South America. 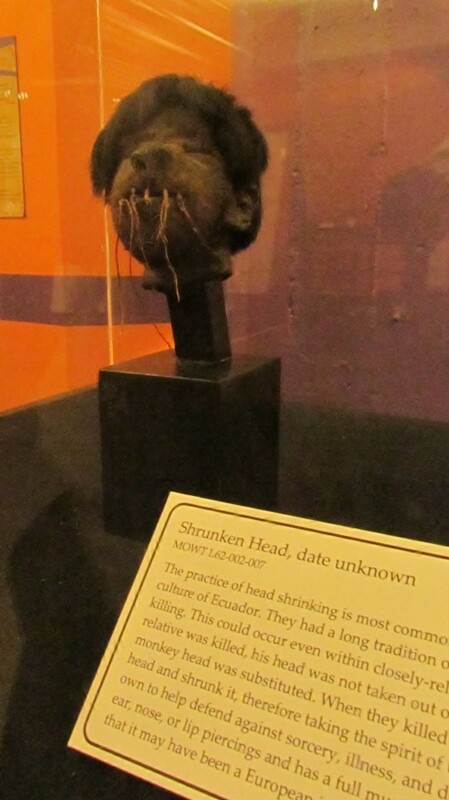 This shrunken head exhibit is surely popular with kids, as are some of the other features of this area. Interactive exhibits teach counting by using the Mayan number system. Visitors can also touch materials that represent those found in many of the pieces in the displays. 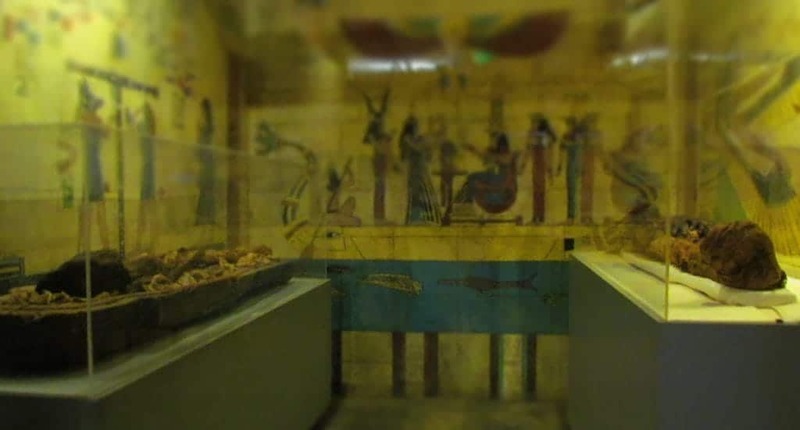 The final section on the first floor is reserved for the Ancient Egypt exhibit. A variety of items can be found in this area, but my favorite was the replica of an ancient tomb. 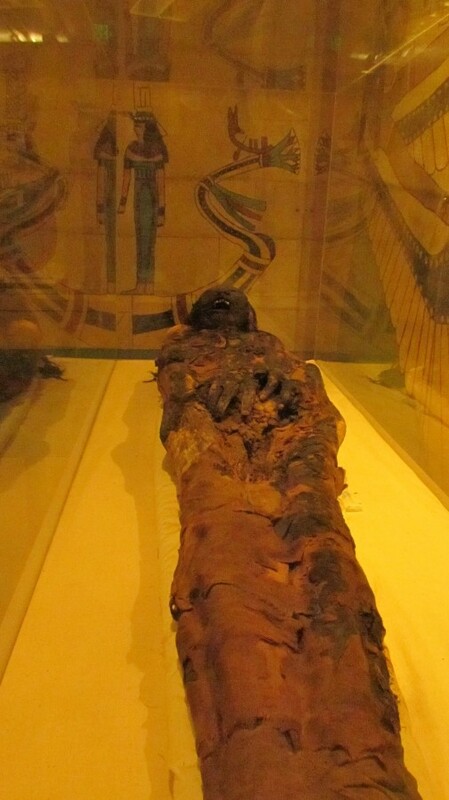 The walls are beautifully decorated, and they even have two mummies on display. It is certainly an interesting exhibit. We headed up to the second floor, which is all about conflicts. We started in the “Creating the Crown” exhibit, which highlights various periods in European monarchy. 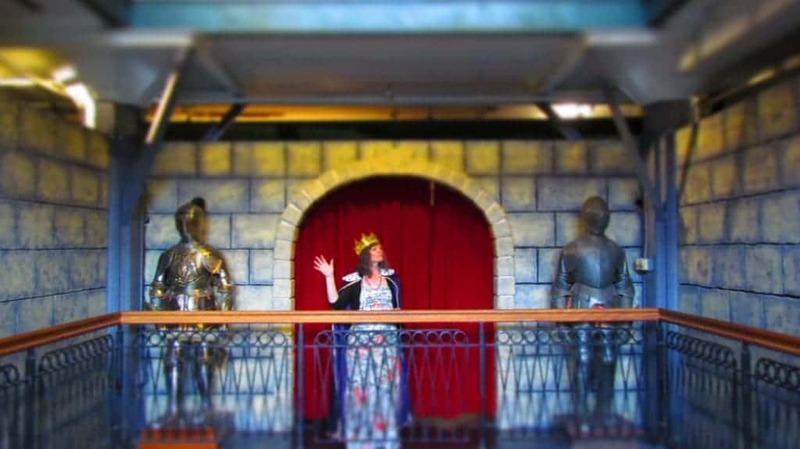 There is an area where guests can play the part of a royal dignitary, much like Queen Crystal did. On the way toward this area, we had a bird’s eye view of the dinosaur display in the atrium below us. Be sure to check it out for a different perspective. The largest portion of the second floor is dedicated to modern warfare. WWI, WWII, the Korean War, and Vietnam War each have exhibits in this area. The amount of information and artifacts is overwhelming. There was just too much to show even a fair portion, so I’m just adding a handful of pictures to give you all a feel of the scope of the exhibits. We finally made the third floor, which has the smallest amount of displays. Part of this floor is used for offices, as well as an event space that can be rented. A children’s activity center was not being used during our visit, but is available. Since our time was running out, we focused on the main exhibit for this floor. 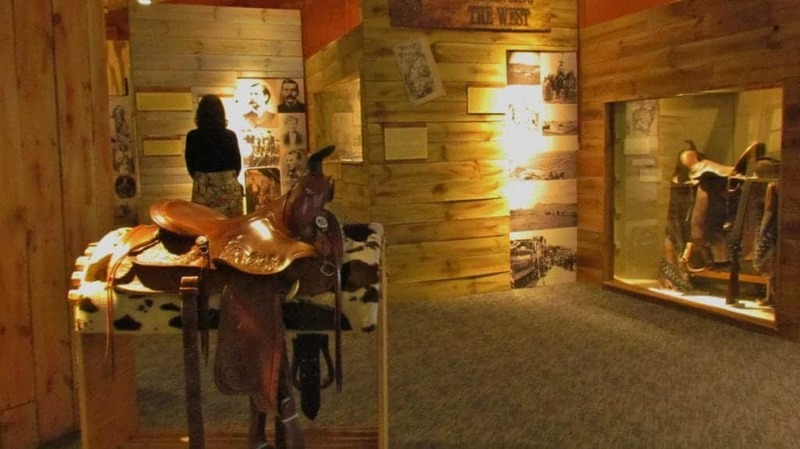 “Romancing the West” focuses on how the idea of westward expansion was romanticized in an effort to draw more people to the newly opened lands. A lot of the displays show the grittier “real” life of pioneers during those days, even though to this day many times those days are still seen in an unrealistic light. It was a great way to wrap up our visit to the Museum of World Treasures. 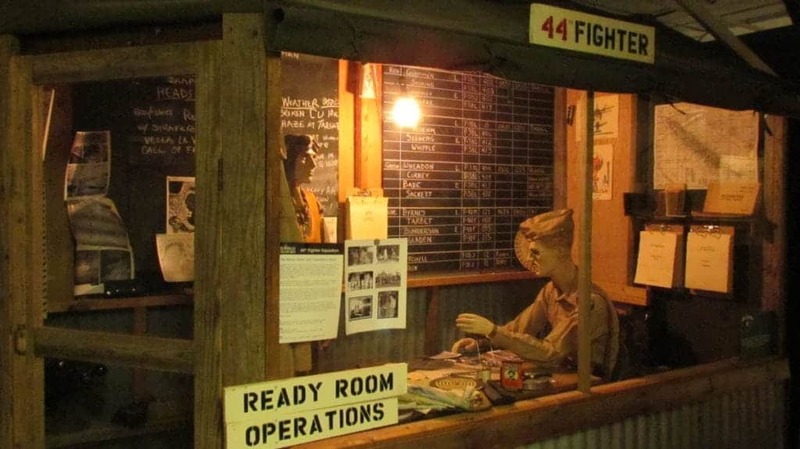 This is clearly a must-see attraction for families, and travelers who like history. Just be sure to set aside at least a couple of hours.